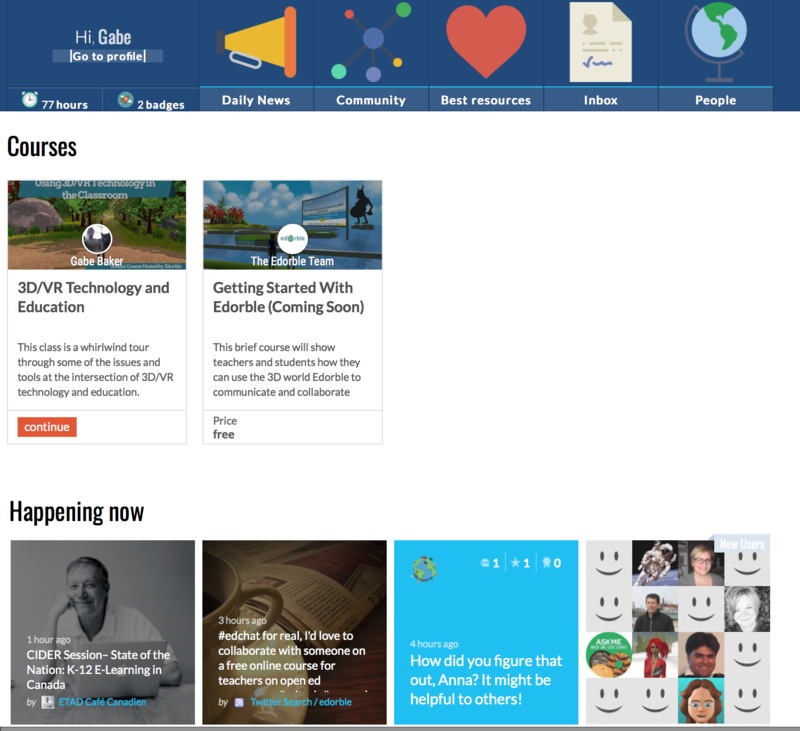 At Edorble, our goal is to make online learning more personal, playful, and powerful. We've been doing that with Edorble, our 3D world that makes it easy for teachers and students to gather in a virtual world to communicate and collaborate. It's early days at Edorble Academy, and the first class is a free course that we are offering about 3D/VR Technology and Education. Feel free to check it out if you're interested in this topic or if you want to get a feel for the platform. Our eventual plan is to integrate Edorble inside of Edorble Academy, to make it easy for classes inside this platform to gather inside a 3D environment to learn or network from their laptop or VR headset. Some of the great features for teachers? A dynamic e-book creator, a social layer that lets the community follow each other, comment, create profiles, and more, a video creator that lets you embed notes/questions inside your videos, a built in assessment engine that supports multiple choice/open ended/third party assessment tools, integration with Microsoft office, easy HTML embeds, easy student management features, the creation of a daily newspaper filled with sources relevant to your community, and lots more. Some of the great features for learners? The ability to highlight or take notes on any part of the content, the social layer that allows easy messaging/profile creation/networking, accessibility across devices (dedicated mobile apps coming soon), and a community of peers interested in similar topics. We're happy to invite you into this community. Whether you want to teach, learn, or network, we'd love to see you there. See that blank space in the image below? Have a great idea for an online course? Help us fill in the blank at Edorble Academy. PS: while we do this, we're definitely not stopping our work on our 3D world for online classes and meetings. Our first build for Oculus Rift and HTC Vive is now in private beta, and our new build for PC and Mac has a neat content management system that makes it easy for teachers or students to display galleries of web content inside their 3D environment. It also lets users create and bring their own 3D environments into Edorble, opening up incredible opportunities for teachers and students interested in 3D design.